Burr Ridge Dumpster Rental – No Smoking Near Dumpsters! Dumpsters may contain flammables such as wood and paper. Lemont Dumpster Rental – Use Protective Gear – At Least Gloves! Prevent contamination, cuts and injuries. Elk Grove Village Dumpster Rental – Clear The Way! Clear debris from paths to or around dumpsters to prevent slipping or falling. Mokena Dumpster Rental – Working Dumpsters! Make sure there are no loose hinges, broken sections or rusted parts on the dumpster. Hickory Hills Dumpster Rental– Keep Kids Away! Make sure kids can’t access the dumpster to play in or around. By following these tips from our Same Day Dumpster Rental location crews, you can ensure a safe and successful rental. Be sure to inquire about any weight limits or what can NOT be placed into a dumpster with one of our offices or on this site. A Dangerous Situation? How Did We Do? With warmer weather approaching, it’s time to tackle your outdoor space and get it primed and ready for all of your upcoming events and social outings! Always check to see if you need to schedule pick up for your dumpster rental otherwise you might be responsible for some hefty late fees. Before you choose a dumpster rental company, make sure you know these biggest rule violators so you don’t rack up penalty fees. What Extra Fees Could A Dumpster Rental Service Charge Me? Some dumpster rental companies levy extra fees if certain violations occur but do you know exactly what you are being charged for and why? Back in the streets, a client gives us a sneak peek at just what he is utilizing a Same Day Dumpster for in Bolingbrook! A few minutes of preparation could save you from paying hefty fines, not being able to finish your project or creating a dire mess on roadways during transit. Your old appliances might be more dangerous than you know so be sure to recycle them with the right programs. 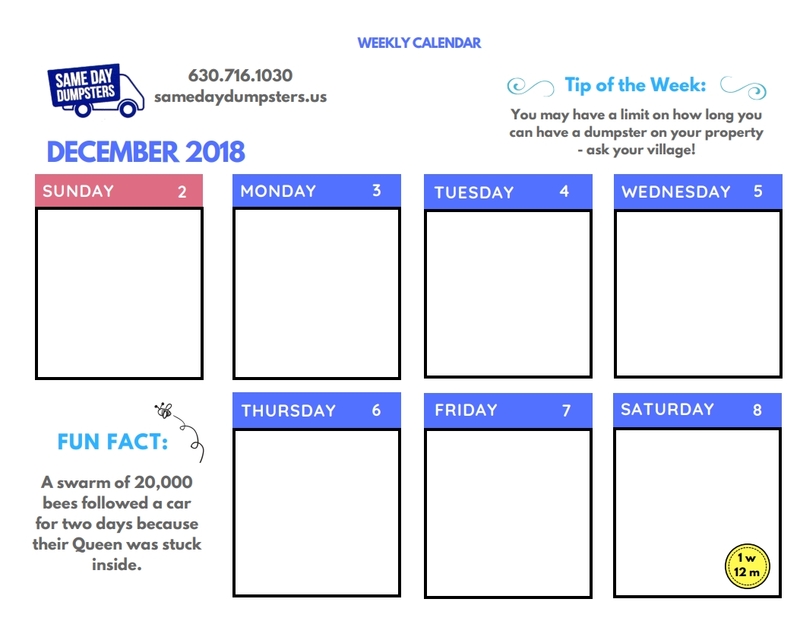 Do not buy the calendar, Same Dumpster Rental will give you a calendar for free. A weekly calendar on our website ready for use. Safety risks may not always be due to user negligence or skirting rules but from the very equipment your local dumpster rental company might be providing. Another stroll through the suburban streets finds our trusty blue dumpster rentals hard at work in the city of Naperville! Same Day Dumpsters wishes you a Happy President’s Day and hopes your long weekend brings you relaxation, reflection and great sales! Dumpster Rental vs. The Bagster – Which One? Which is better – a dumpster or a bagster? This is the question on everyone’s lips when they decide to do a project or start removing junk from a location. Not only can a few small changes help save the environment but it could also spare you money and increase the curb appeal of your home!